Nokia may be better known as a brand from yesteryear, but that doesn’t mean it’s done just yet. 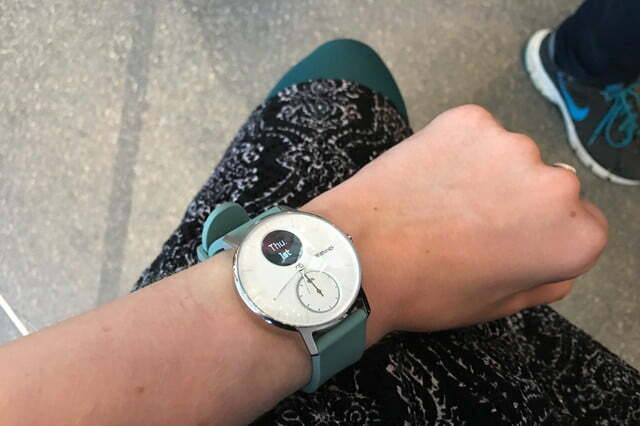 In fact, it’s making a pretty big announcement Thursday — the launch of the Withings Steel HR, which is the company’s first new smartwatch since it bought Withings in April. The Steel HR is a continuation of the Steel series of smartwatches and brings together a super sleek and stylish design and functionality. The Steel line is known for its ultra-minimalistic look, and while the devices may not boast as much functionality as other smartwatches, the trade-off is a beautiful design. We went hands on with the Withings Steel HR to see how it compares to other smart analog watches. Withings’ first forays into the wearable space were two gorgeous analog smartwatches called the Activité and Activité Pop. The Steel HR uses many of the same design elements from the Activité watches, including a gorgeous stainless steel casing, which comes in both 36 and 40mm sizes to suit a variety of wrists. The 36mm watch is compatible with 18mm bands, while the 40mm watch supports 20mm straps. Withings offers a number of different watch straps for the new Steel HR models, including sleek leather ones and colorful silicon ones. We particularly liked the light robin egg’s blue strap and the sweet raspberry red one, however, there are more subtle black, gray, and brown color options for those who don’t want anything too colorful. Both of the Steel HR watches fit comfortably on my slim wrist and looked like a normal watch. Like previous Withings watches, the Steel HR features analog watch hands with a small subdial that shows how much of your daily activity goal has been achieved. However, there are two new additions to the Steel HR that put it a step above last year’s Activité. The previous Withings watches didn’t offer a display or a heart rate sensor, so you always had to sync it up with the Withings HealthMate app to see your metrics. Now, the crown on the side of the watch functions as the power button for a tiny, round display on the watch face. The display shows all your fitness metrics like calories burned, steps taken, distance traveled, and your heart rate. The display can also show you notifications from your smartphone and the date. The heart rate monitor can track heart rate continuously throughout a workout session or it can take passive heart rate data to save power. You can activate the heart rate monitor simply by pushing on the device’s button. Not only that, but the Steel HR can also monitor your pulse while you’re sleeping, which can help give an overall look at your health. You can see your heart rate live on the small display in the watch face, which is pretty neat for a device that looks like a normal analog watch. It’s a beautiful device that will surely appeal to those who aren’t overly interested in smartwatches with full-on displays. The sizing and design may appear more feminine than masculine, but it’s a matter of personal style. 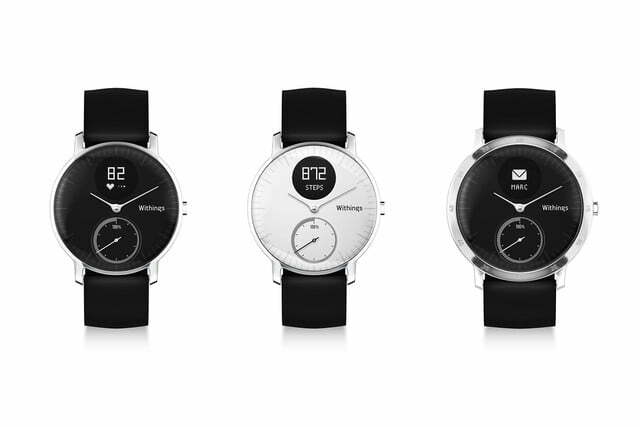 Perhaps the best thing about a watch that isn’t a full-on smartwatch is the battery life — the Withings Steel HR boasts a whopping 25 days on a single charge, far more than the daylong battery life most smartwatches offer. Not only that, but after the 25 days is over, the watch will transition into a non-activity-tracking mode, which will extend the watch’s life an extra 20 days, giving the device a total of 45 days of battery life. However, if you have continuous heart rate tracking on all the time, it’ll only last you 5 days before you need to pop it onto the magnetic charging disk to juice up. Still, that’s much longer than your average smartwatch. The 36mm Withings Steel HR comes with a price tag of $180, and the larger 40mm device costs $200. 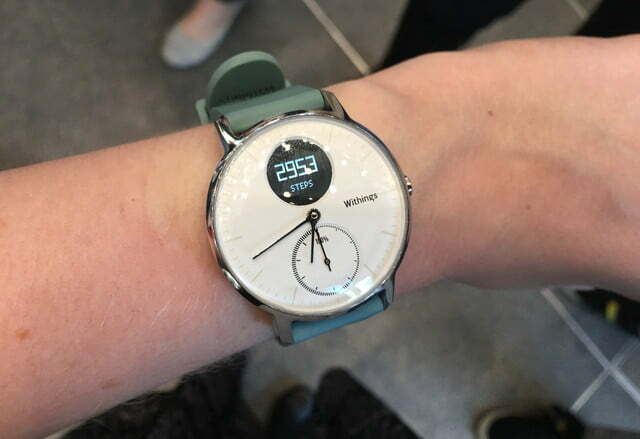 According to Withings, the watch will be available at the end of October.